While fanfare was humming in the Nation’s capitol, locals from Rockland, the Hudson Valley and Bergen County had a celebration of their own at the Mahwah Sheraton on January 20. More than 150 guests, many in formal attire, watched Trump’s inauguration replayed and joined in toasting the outcome of the election. After veteran Ron Brooks sang the National Anthem and Steven Rogers, who is Chris Christie’s opponent for New Jersey governor spoke to the audience, the party got underway. The Black Dirt Bandits, who played at the Trump rally at Rhoades Tavern in Sloatsburg, joined Trump supporters again and played a medley of music that brought both Millennials and Boomers on to the dance floor. Audrey Johnson Scheper of Piermont is a career coach and Trump supporter. 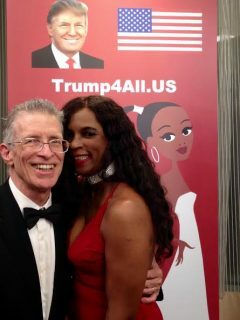 Together with her husband, Glenn, she hosts a YouTube show called Trump4all.us. The couple was at the Sheraton interviewing guests to capture their reaction to the campaign antics and inauguration.